1. The Post is committed to protecting your privacy. The Post knows that you care how information about you is used and appreciates your trust in it to do that carefully and sensibly. At times you will be asked to submit personal information about yourself (name, email address, postcode etc.). By entering your details in the fields as requested you enable The Post to provide you with the services you select. Whenever you provide such personal information, The Post will treat that information in accordance with this notice and policy. All email correspondence includes instructions on how to 'unsubscribe' from the service to which you have subscribed. The Post will act in accordance with current legislation. This notice and policy do not apply to companies that The Post does not own or control. 2. Use of Data. The Post will use your personal details and information it obtains from other sources to provide you with its services, for administration and customer services, for marketing, to analyse your preferences and to ensure that the content, services and advertising that it offers are tailored to your needs and interests. The Post may keep your information for a reasonable period for these purposes. The Post may need to share your information with its service providers and with other associated companies for these purposes. The Post may disclose personal data in order to comply with a legal or regulatory obligation. 4. How Cookies are Used. When you log in to the Website the Post will set a cookie containing a randomly generated unique reference number. This anonymous number allows the Post to identify you. The Post will never store your personal information directly as a cookie. By default, user cookies will be session cookies. Session cookies are automatically deleted when you close your browser. To be recognised on your next visit to the Website you will have to log in once more. If, as you log in, you tick the checkbox labelled "Remember me on this computer", a persistent cookie will be set. Persistent cookies are not deleted when you close your browser, and will allow the Website to recognise you on your next visit. The use of persistent cookies is not advised on shared computers (such as in web cafes, schools, colleges, universities or public libraries). 7. Third Party Cookies. Some of the advertisements you see on the website are generated by third parties. Some of these third parties generate their own cookies to track how many people have seen a particular advertisement and to track how many people have seen it more than once. These cookies cannot be used to identify an individual; they can only be used for statistical purposes, for example, in providing you with advertisements that are more relevant to your interests. Some of the information from third party cookies will be brought together with other anonymous information for statistical purposes. The third party companies that generate these cookies have their own privacy policies. Other than allowing these cookies to be served, we have no role to play whatsoever in these cookies (although we may use statistical information arising from these third party cookies and provided to us by third parties, to improve the targeting of advertisements to users of the website). 10. Credit References. In assessing your application for credit, to prevent fraud, to check your identity and to prevent money laundering, the Post may search the files of credit reference agencies who will record any credit searches on your file. This may include using N2Check or an equivalent company. The Post may also disclose details of how you conduct your account to such agencies. The information will be used by other credit grantors for making credit decisions about you and the people with whom you are financially associated, for fraud prevention, money laundering prevention and occasionally for tracing debtors. Information used for these purposes will include publicly available information such as electoral roll, county court judgments, bankruptcy orders or repossessions. 11. Credit Reference Agencies. The Post may ask credit reference agencies to provide a credit scoring computation. Credit scoring uses a number of factors to work out risks involved in any application. A score is given to each factor and a total score obtained. Where automatic credit scoring computations are used, acceptance or rejection of your application will not depend only on the results of the credit scoring process. 12. Sharing Data. The Post may also share your information with its business partners in the travel, property, automotive, financial services, leisure, entertainment, advertising, media, retail and mail order business for marketing purposes or it may send you information about other organisations' goods and services. The Post may contact you by mail, telephone, fax, e-mail or other electronic messaging service with offers of goods and services or information that may be of interest to you. By providing the Post with your fax number, land line and/or mobile telephone numbers or email address, you consent to being contacted by these methods for these purposes. If you do not wish to receive marketing information from the Post or from the Post's business associates, tick the appropriate box on the form you complete. 13. Third Party Data. If you provide the Post with information about another person, you confirm that they have appointed you to act for them, to consent to the processing of their personal data including sensitive personal data and that you have informed them of the Post's identity and the purposes (as set out above) for which their personal data will be processed. 14. Links to Third Party Sites. The Post links to a wide variety of other sites and it displays advertisements from third parties on the Website. The Post is not responsible for the content or privacy policies of these sites and third party advertisers, nor for the way in which information about their users is treated. In particular, unless expressly stated, the Post is not an agent for these sites or advertisers nor is it authorised to make representations on their behalf. 15. Requests. You are entitled to ask for a copy of the information the Post holds about you (for which the Post may charge a small fee) and to have any inaccuracies in your information corrected. 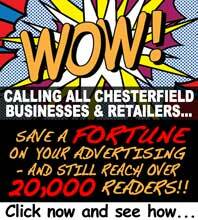 If you wish to exercise your rights to this information please forward your request, in writing, to The Chesterfield Post. 16. Changes to this Policy. This data protection notice may change and therefore you should review it regularly. The Post will of course notify you of any changes where we are required to do so.